that far exceeded the physical locations of the speakers, which disappeared admirably into the soundstage. Width and the depth were well extended, but I felt that height was slightly lacking compared to what I normally perceive with larger speakers." Features "The CM1 ($900 USD per pair) is a minimonitor that belongs to B&W's CM series, which is described as a contemporary take on classic speaker design." "The driver complement consists of a 1" aluminum-dome tweeter and a 5" woven-Kevlar-cone bass/midrange unit. B&W claims that the tapered-tube "tail" of the tweeter helps reduce excess sound radiation, thus aiding in imaging and preventing the speaker from sounding boxy. Additionally, the woven-Kevlar mid-woofer helps dissipate concentric standing waves that can cause colorations." Use "Due to their protective caps, the binding posts can accommodate only spade connectors or bare wire. This is a EU safety requirement that forbids the insertion of plugs into binding posts, so if you have banana-plug-terminated speaker cables, you're out of luck." Value "As the price of speakers seems to creep ever upwards, the B&W CM1 shows that there are still very accomplished speakers at the low end of the price scale." While audiophiles all have their favorite brands of speakers, B&W, the acclaimed British maker, is universally considered to be at the forefront of loudspeaker design and manufacturing today. B&W's storied history dates back to the mid-1960s and includes the use of some innovative materials, including DuPonts Kevlar -- the same material used for bulletproof vests -- for driver cones, and synthetic diamond for tweeter domes. B&W speakers are used as reference transducers in nearly all of the classical recording studios around the world, including EMI Abbey Road, Decca, and Deutsche Grammophon. The company's R&D facility located in Steyning, West Sussex, Great Britain is credited with the development of the Nautilus loudspeaker, which has been described as "possibly the best loudspeaker money can buy." The technology used in this speaker eventually trickled down to lower-priced offerings like the Nautilus 805 minimonitor that I have used as my reference for the past few years. As part of a continuing series of reviews of high-value minimonitors, I was delighted to evaluate B&Ws new CM1. Given my familiarity with B&W sound, I looked forward to hearing this new speaker and determining how it performed when compared to my tried-and-true reference. The CM1 ($900 USD per pair) is a minimonitor that belongs to B&W's CM series, which is described as a contemporary take on classic speaker design. I was immediately struck by the physical beauty of these speakers. The real-wood maple finish of the review speakers was exquisite, and the clean lines and lustrous light wood exuded Scandinavian chic. The dark-gray grilles are magnetically attached to the cabinet, which eliminates unsightly holes on the front, making the CM1 one of a handful of speakers that looked finished sans grille. In addition to maple, the CM1 is also available in wenge and rosenut real-wood finishes with black or dark-gray grilles. 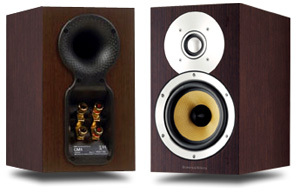 Other speakers in the CM series include the CM7 floorstander and CM Center center-channel speaker. All of the CM-series speakers are magnetically shielded to allow for home-theater use. The CM1 is quite small at 11" high, but it is nearly as deep, 10.9", and 6" wide. The cabinet sounded solid when I rapped on it, which explained the speakers 15-pound weight. The bottom of the cabinet has embedded nuts for attaching the speakers to B&W's FS-700/CM stands. B&Ws signature Flowport is around back, and it incorporates dimples on its surface to reduce air turbulence. According to B&W, this eliminates "chuffing" when the speaker is moving large volumes of air. The driver complement consists of a 1" aluminum-dome tweeter and a 5" woven-Kevlar-cone bass/midrange unit. B&W claims that the tapered-tube "tail" of the tweeter helps reduce excess sound radiation, thus aiding in imaging and preventing the speaker from sounding boxy. Additionally, the woven-Kevlar mid-woofer helps dissipate concentric standing waves that can cause colorations. The crossover frequency is 4kHz. Connection is by way of high-quality binding posts that allow biwiring, which the manual suggests improves resolution of low-frequency detail. Due to their protective caps, the binding posts can accommodate only spade connectors or bare wire. This is a EU safety requirement that forbids the insertion of plugs into binding posts, so if you have banana-plug-terminated speaker cables, you're out of luck. You can always try to pop the safety caps off, but this would have to be done very carefully to avoid damage, if it can be done at all. The frequency response of the CM1 is stated as 55Hz-22kHz +/- 3dB on reference axis, with 45Hz-50kHz at -6dB. The quoted sensitivity is a low 84dB (2.83V at 1m) with a nominal impedance of 8 ohms (5.1 ohms minimum). I was worried by the low sensitivity specification -- I would be using mono tube amplifiers with a moderate amount of power to drive the speakers -- but B&W advises that the power handling of these speakers is 30-100 watts at 8 ohms, so they don't require gobs of power. A Marantz SA-8260 CD/SACD player fulfills SACD-playback duties in my system and feeds Musical Fidelitys "Triple Threat" digital bundle consisting of the X-10v3 tube buffer, X-DACv3 digital-to-analog converter and X-PSUv3 external power supply for CD playback. My preamplifier is a ModWright SWL 9.0 SE, which is used with Quicksilver Mid-mono amplifiers. The Quicksilver amps are equipped with Electro-Harmonix KT90 tubes to output 60 watts via their 8-ohm taps. Cabling consists of Audio Art Cable IC-3 interconnects, PS Audio X-stream Plus speaker cables, and Shunyata Research Diamondback power cords. Power-line accessories include a Monster HTS-5100 Mk II power conditioner and a PS Audio high-current Ultimate Outlet. Components are placed on a Plateau equipment rack. A pair of Sound Organization 24" metal speaker stands filled with sand supports the speakers. Other accessories include Finite Element Ceraballs placed under the preamplifier and the CD player. My 13'L x 11'W x 8'H listening room is treated with three Echobusters panels lining the space behind the speakers, which were arranged on the longer wall. The listening position was 7.5' away from the speakers. As mentioned earlier, B&W Nautilus 805 loudspeakers are my reference, but I also compared the CM1s to NHT Classic Threes that I reviewed earlier this year. The manual recommends approximately 15 hours of break-in time -- a low amount by audiophile standards -- but I ran the speakers continuously for 40 hours before I began any critical listening. I had to experiment with placement before settling on a best location, which happened to be 32" from the side walls and 27" from the front wall. As with most speakers, the CM1s tend to sound much better when they have some breathing room behind them, but if this is not an option you should consider using the supplied foam plugs to block the ports. All of my listening was done without the grilles, though I did not notice any detrimental effects with the grilles in place. I started off my listening with Miles Daviss In a Silent Way [Columbia Legacy 9699-8655-2]. The CM 1s revealed a rich portrayal of the trumpet, with silky-smooth treble and absolutely no trace of harshness or edginess. The notes were carved out of space, portraying a delicate airiness that conveyed Daviss prowess on the horn in a most convincing manner. In fact, like the namesake of the first track "Shhh/Peaceful," the CM1s were relaxing to the point where reviewing clichés kicked in -- I forgot all about the review and just enjoyed the music. "Green Peppers" from Herb Alperts remixed Whipped Cream & Other Delights Re-whipped [Shout Factory 97641] has additional bass mixed into the original track. The CM1s reproduced it with so much slam and visceral impact that I could only stare at the small 5" woofer in disbelief. These speakers could generate prodigious amounts of low-frequency energy, and not of the slow, wooly variety either. The bass was taut, well defined and musical with accurate speed and timing, which are often the hallmarks of smaller bass drivers -- just not ones this small. More jazz. Patricia Barbers new Live - A Fortnight in France [Blue Note 724357821322] is a live compilation of Barber's recent performances in France. The CM1s painted a vivid and detailed soundstage from this CD that far exceeded the physical locations of the speakers, which disappeared admirably into the soundstage. Width and the depth were well extended, but I felt that height was slightly lacking compared to what I normally perceive with larger speakers. Retrieval of musical detail was remarkable, however, with the CM1s revealing some previously obscured nuances. The speakers exhibited a masterful separation of instruments in the mix and maintained their poise even when the musical score became dense. Hall acoustics and listening-venue ambience were presented convincingly, though, again, with a slight compression in terms of height. The low sensitivity of these speakers did not intrude upon my listening, even when I was heavy-handed with the volume knob. I never did get to the point where I sensed any distress or congestion. One of the qualities of any speaker that I keenly seek is imaging ability, and this was one of CM1s strengths. Diana Kralls Girl in the Other Room [Verve 0249861533] is not only noteworthy for Krall's stellar singing and playing, but also for the quality of the recording. Listening to the title track with the CM1s, I heard Kralls seductive and husky voice reproduced with spooky realism and presence. Every inflection and intake of breath was crystal clear, and this illusion is amongst the best that I have ever heard from my system. One of Herbie Hancocks later works, Canteloupe Island [Blue Note 724382933120] has expressive and expansive imaging, and the CM1s presented this with aplomb. The title track, which opens the album, has Freddie Hubbard playing trumpet to the left rear of the stage, while Hancock plays piano in the center and forward of Hubbard. The positioning of the artists and the places they occupy between the speakers was rendered with razor-sharp holography. Additionally, cymbal strikes had the appropriate amount of shimmer and natural decay. Again, the CM1s were very convincing. However, jazz recordings with sparse instrumentation are some of the easiest to reproduce. How well could the CM1s rock? I have always liked Matchbox 20, mainly because of lead singer Rob Thomass vocal dexterity. His voice expresses both strength and vulnerability. Listening to Yourself or Someone Like You [Lava Records 7567-92721-2], I heard the emotion in his voice conveyed with impact, an indication of the CM1s' midrange prowess. This CD is not exactly what I would refer to as a great recording, but the CM1s were forgiving. The music did not sound overly compressed or disintegrate into a cacophonic mess when I cranked up the volume, both of which have happened in the past. Likewise, Adam Duritzs mournfully distinctive voice on the Counting Crows CD August & Everything After [DGC 206424528-2] was reproduced as faithfully as I have heard. Though the CM 1s sounded good with well-recorded pop and rock, they really shone with jazz, the tapered-tube tweeters hitting their stride with brass and cymbals. The CM1 is logical competition for the NHT Classic Three, which costs $800 per pair, even though the CM1 is a two-way design, while the Classic Three is an unusual sub-$1000 three-way. I had just finished reviewing the Classic Threes when the CM1s showed up, so their sound was fresh in my mind when I began listening to the CM1s. The high-frequency performance of the B&W speakers sounded more refined and smoother than that of NHTs, which seemed slightly recessed in comparison. The difference wasn't glaring, but careful listening made it plain. As a result, the Classic Three sounded more laid-back. The midrange performance of both the speakers was almost identical, which is say that both sounded rich and detailed. The CM1's bass extension and impact were superior; the B&W speakers energized the room with low-frequency information in a way the NHT speakers couldn't. 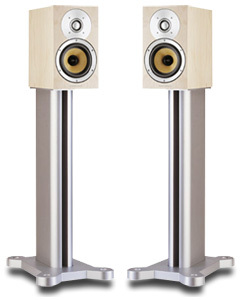 Soundstage width was rendered equally well by both, with depth being better defined by the CM1 and height being better accounted for by the Classic Three. The CM1 produced more air around the instruments and generally had better imaging, perhaps because of their more refined treble. The CM1 also had an advantage in detail retrieval, while the Classic Three could play louder with less power. By my reckoning there was no clear winner. Either speaker would be well suited to a high-quality music-orientated system in a smaller room. B&W states that the CM1 was developed in tandem with the Nautilus 805S, sharing driver and crossover technology. When I compared the CM1 to my Nautilus 805 ($2000 per pair when still available), the predecessor to the current 805S, I found the resemblance to be uncanny. The buttery-smooth treble, a highlight of the 805 and the main reason I use it as my reference, was present in the CM1 in almost equal measure. I say "almost" because on certain tracks the tweeter in the 805 bettered the CM1s in terms of ultimate finesse -- conveying the finest detail and air. Regarding imaging ability, the CM1 was almost as good as the 805, which is a feat in itself considering that the CM1s tweeter is mounted inside the cabinet as opposed to the 805s top-mounted pod. The 805 did a better job of defining instruments in space, sounding more spacious and airy. The width and depth of the soundstage projected by both speakers were similar, with the 805 having a distinct advantage in height, perhaps due to the contribution of the externally mounted tweeter. Bass seemed to have a smidgen better definition with the CM1, maybe due to the speed of the smaller driver, but overall extension was in favor of the 805 -- it has a larger woofer and cabinet. If I had to assign numbers, I would say that the CM1 has 80% of the 805s performance, which implies compelling value when you consider that the CM1 costs 45% of the 805's price. The B& W CM1s are attractively styled minimonitors that will provide a rewarding listening experience. Their tweeter is the best that I have heard in the under-$1000 price range, approaching the performance of tweeters in much higher-priced speakers and validating the trickle-down claims of B&W. As noteworthy is the highly accomplished 5" Kevlar woofer, which lays down a foundation that is as good as that of many larger speakers. Properly positioned, the CM1s can immerse the listener in a deeply layered three-dimensional soundstage with stellar imaging, the only caveat being a slight compression of soundstage height. The midrange is rich but not overly ripe. Vocal realism is startling, creating a "they are here" feeling. The CM1s are quite forgiving, so matching with an amplifier and source is a less of an issue. In terms of overall value, I nominate the B&W CM1 as a contender for top honors. As the price of speakers seems to creep ever upwards, the B&W CM1 shows that there are still very accomplished speakers at the low end of the price scale. Price: $900 USD per pair.